Using a variety of materials, we can construct decorative and functional retaining walls that will enhance your outdoor space. Traditional brick and mortar, free-standing natural stone, and block masonry are all options available for your retaining wall construction. Crumbling or missing mortar between bricks and stones can allow water to penetrate and cause serious damage to your home. Let us inspect the problem in your exterior walls or chimney to determine if repointing is the best solution and we may be able to extend the life of your masonry at a lower cost than replacement. 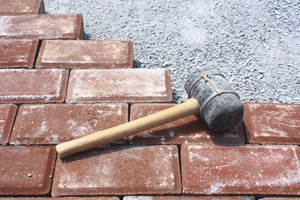 Our expert masons will restore the structural integrity of your masonry and beautify it as well. Time and the elements can cause bricks and stones to come loose from the mortar. If the structure remains intact, it may be possible to replace only the missing bricks or stones for a cost-effective repair. Chimneys are often overlooked on homes and can fall into disrepair, and even present a smoke or fire hazard to homeowners. From repointing to a complete demolition and rebuild, we can get your chimney back into form. The glow of a fire from the hearth of your own custom fireplace can really warm up a home. From outdoor fire pits to natural stone interior or exterior fireplaces, we can design, build and repair them all.